The Giftly Visa® Gift Card may be used only at merchants in the U.S. and District of Columbia wherever Visa debit cards are accepted. See Cardholder Agreement for details. While the gifter suggested something they thought you'd like, you are free to get exactly what you want. If you need to update your registration information, contact Customer Support at 877-357-4975. 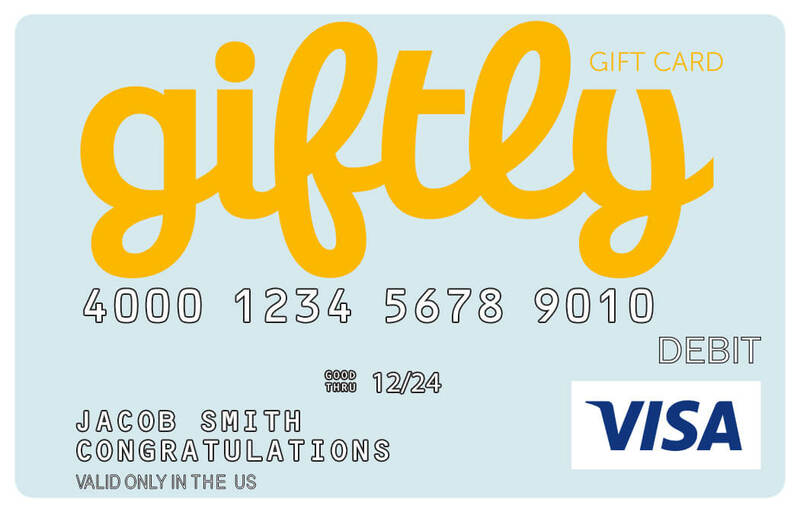 The Giftly Visa® Gift Cards are issued by MetaBank®, Member FDIC, pursuant to a license from Visa U.S.A. Inc. The Visa Gift Card can be used everywhere Visa debit cards are accepted in the U.S.A. No cash or ATM access.